* 10 Boxes per case choose from any size. The combination of comfort and strength make Diamond Grip PlusTM	a leading latex glove of choice for many medical professionals. 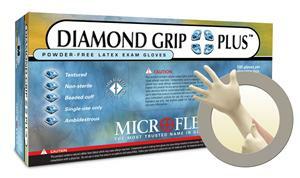 Diamond Grip PlusTM gloves offer a consistent and secure wet and dry grip. Great elasticity, a comfortable fit, and excellent tactile sensitivity make Diamond Grip PlusTM	a perfect multi-purpose glove. Diamond Grip PlusTM gloves offer a superior combination of comfort and durability in an all- purpose glove. Made from natural rubber latex (NRL), Diamond Grip from (Microflex) offers its users the best barrier protection in areas of potential risk associated with blood-borne pathogens and other substances or biohazards. The physical properties of the material provide excellent flexibility and uncompromised protection with high degree of sensitivity. GloveSaver's Latex gloves provide excellent comfort and feel. Diamond Grip Latex out performs other glove materials in terms of elasticity and tensile strength, such as Nitrile and Vinyl gloves. 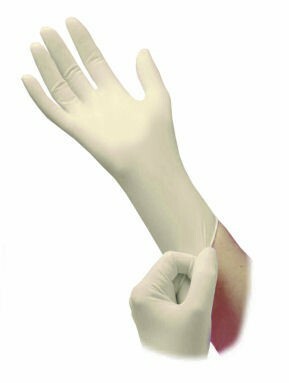 Our Diamond Grip latex examination gloves are very affordable and economical in terms of pricing. We offer a lower price per case on Diamond Grip Latex Gloves to save you money and keep you coming back to us for your gloves.